These two great westerners had very different ideas about what it meant to love the land and try to care for it, and they did so in distinctly different styles. Boozy, lustful, and irascible, Abbey was best known as the author of the novel The Monkey Wrench Gang (and also of the classic nature memoir Desert Solitaire), famous for spawning the idea of guerrilla actions--known to admirers as "monkeywrenching" and to law enforcement as domestic terrorism--to disrupt commercial exploitation of western lands. 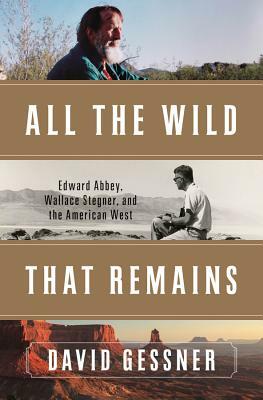 By contrast, Stegner, a buttoned-down, disciplined, faithful family man and devoted professor of creative writing, dedicated himself to working through the system to protect western sites such as Dinosaur National Monument in Colorado. Gessner takes us on an inspiring, entertaining journey as he renews his own commitment to cultivating a meaningful relationship with the wild, confronting American overconsumption, and fighting environmental injustice--all while reawakening the thrill of the words of his two great heroes.